Had awesome interviews this morning at Seattle's Q13 news and KOMO-AM radio, and are prepping for a reading/signing/trivia quiz/prize giveaway at University Books at 7 pm. 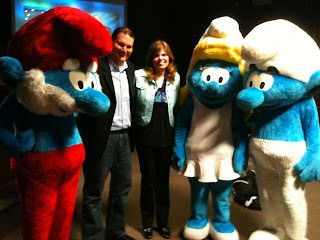 But already the highlight of our day has happened -- we met the Smurfs. Papa Smurf, Smurfette and the third one, who introduced itself as "Normal Smurf." As if any Smurfs are normal.